FILE - A man walks by the slum of Mathare, one of the poorest slums in Nairobi, May 28, 2014. Hundreds of movie lovers gathered in front of a giant outdoor screen in Nairobi's Mathare slum on Monday at the start of the Slum Film Festival, which aims to challenge perceptions of shanty towns as dens of crime and squalor. The unique festival, in its fifth year, gives a platform to documentaries and short films coming from, or about, slums from around the world. 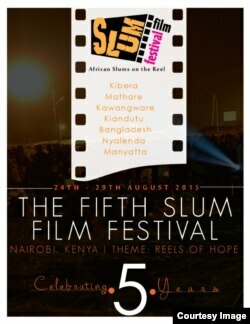 "There's a two-sided story," Solomon Mwendwa, the festival's 28-year-old director, told the Thomson Reuters Foundation. "There is the ugly side [of the slums] but there is also so much talent in these slums that needs to be exposed." One of the most high-profile films being shown at the six-day festival is by George Nsamba, a filmmaker from Uganda who grew up in the slums of its capital, Kampala. His short film, "Silent Depression", is about a young man who gets depressed because he spends so much time on social media. "What if smartphones belonged to our pockets, while our attention belonged to the person next to us?" Ugandan rapper Malcolm Kawooya asks in the spoken word short film. The rhyme castigates "YouTube celebrities yet real life loners" and people who "tweet about the moment but never enjoy it." Around a third of the 30 plus films being shown were made by Kenyans who grew up in the slums, with others from countries as diverse as Argentina, Malaysia, Nigeria and the United States. "The main message that we try to bring home is the fact that you have been born in a slum does not necessarily mean that is your end story," said Mwenda. "You can change your story." The festival was preceded by a workshop where 12 young filmmakers were helped to develop their story ideas. The best concept was then shot and will be shown at the festival. Seven awards will be given for categories ranging from best contemporary African film to best original screenplay.